About 2,000 delegates gathered for the handing over of the presidency. 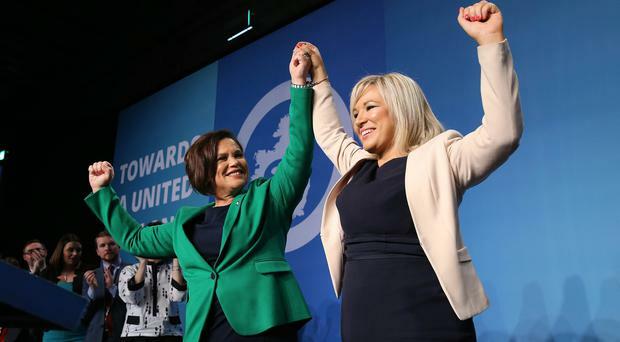 Gerry Adams’ tenure as leader of Sinn Fein has come to an end after more than three decades, with Mary Lou McDonald officially taking over as party president. The Dublin Central TD was officially ratified as the new Sinn Fein leader at a special party conference in the RDS in Dublin on Saturday afternoon. Around 2,000 delegates gathered at the conference for the historic handing over of the presidency. Mr Adams announced in November that he would be stepping aside after 34 years in the role. In her first speech as the new party president Mrs McDonald said she wanted to secure and win a referendum on Irish unity. “I want us to achieve this with respect, graciousness and generosity. “Irish unity cannot be a crude exercise of simply stitching north to south and returning to business as usual. “We do not want a 32 county free state. We want a new Ireland, in which rights are guaranteed, cultures respected and the diversity of our identities embraced,” she added. “Now is the time for fresh thinking and bold ideas to take us forward,” she said. Mrs McDonald warned that Brexit represents a real threat to the prosperity, economic, social and political life of Ireland. “It fundamentally challenges 20 years of hard won progress. “There can be no imposition of a border on the island of Ireland. Referring to the political crisis at Stormont she insisted that Sinn Fein is “up for a deal”. She said: “We are committed to real powersharing, to working for agreement with our unionist partners. “We want the Assembly and Executive up and running. This can only happen on the basis of equality, respect and integrity for all. “The talks are ongoing. The Sinn Fein team is committed to positive outcome,” she said. Paying tribute to Mr Adams, Mrs McDonald said: “There would be no Good Friday Agreement, no peace process without Gerry Adams. My political mentor. An inspirational leader. A great friend. Sinn Fein’s Northern Ireland leader Michelle O’Neill was also officially ratified as Mrs McDonald’s deputy. 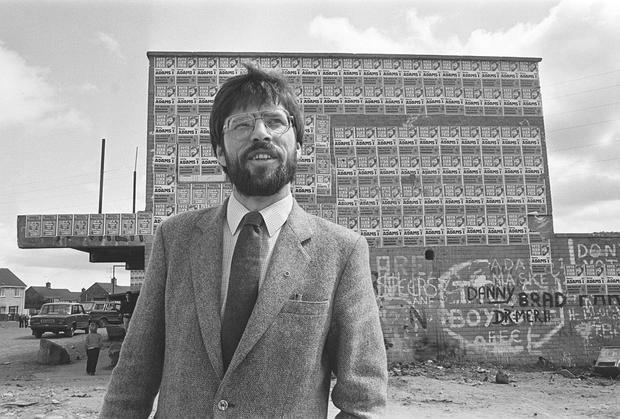 PACEMAKER BFST 11-06-2001:Sinn Fein's Gerry Adams can put his feet up and relax after a gruelling few weeks on the campaign trail after a sucessful Westminster Election and local council election. He is pictured at the local election count at Belfast City Hall. PACEMAKER BFST 26-03-98; Gerry Adams pictured with his wife Collette at Belfast's City Hall. PACEMAKER BELFAST 22/1/99 US congressman Peter King pictured with Gerry Adams outside Sinn Fein HQ on the Falls Road. PACEMAKER BELFAST 9/12/99 Sinn Fein leader Gerry Adams pictured with the Ford Mondeo and Bugging device which he claims were planted by British Intellegance officers as he and Martin McGuniiess were having meeting with the IRA during the Mitchell review. PACEMAKER BFST 01-07-98;Sinn Fein President Gerry Adams signs in Martin McGuinness and Alex Maskey into the first day of the New Northern Ireland Assembly , Wednesday July 1, 1998, inside Castle Buildings, Stormont, Belfast, Northern Ireland ,on the first day of the new Northern Ireland Assembly. PACEMAKER BFST 16-06-2000: Sinn Fein President Gerry Adams at the funeral of close friend and leading republican Terrance 'Cleeky" Clarke who died of cancer. Adams is pictured comforting Clarke's daughter Marie behind the cortege. PACEMAKER BELFAST 08/09/2015: Theresa Villiers has told MPs that despite a request from the DUP, the government does not think the time is right to suspend Northern Ireland's devolved institutions. Ms Villiers will be joined by Irish Foreign Affairs Minister Charlie Flanagan at Stormont House for talks with the Northern Ireland political party. President of Sinn Féin Gerry Adams arriving for the talks. Picture By: Arthur Allison. PACEMAKER BELFAST archive 2/12/1993 1148/93 Sinn Fein leaders Gerry Adams & Martin McGuinness at press conference at Conway Mill where they spoke of secret negotiations with the British Government on a peace process. Pacemaker Bfst Ltd archive Gerry Adams File pic of him at an IRA Funeral in Derry . 10/2/2010 PACEMAKER PRESS INTL BELFAST. SINN FEIN PRESIDENT GERRY ADAMS PICTURED AT THE SINN FEIN OFFICES, STORMONT. PICTURE CHARLES MCQUILLAN/PACEMAKER. 29/1/2010. PACEMAKER BELFAST. GERRY ADAMS TALKS TO THE MEDIAOUTSIDE HILLSBOROUGH CASTLE AS TALKS CONTINUED BETWEEN THE DUP AND SINN FEIN WITH STILL NO AGREEMENT IN SIGHT. PICTURE CHARLES MCQUILLAN/PACEMAKER. Commemoration of Bloody Sunday march in Derry. Gerry Adams and Martin Maguiness are pictured. Pacemaker Press Intl. 30/1/83. 18 FEBRUARY 1992: FUNERALS OF KEVIN BARRY ODONNELL AND SEAN FARRELL TWO OF THE FOUR IRA MEN KILLED BY THE ARMY IN COALISLAND AFTER AN ATTACK ON THE LOCAL POLICE STATION. PACEMAKER BELFAST 26/3/2007 Democratic Unionist Party leader The Reverend Ian Paisley (left) and Sinn Fein President Gerry Adams speak to the media during a press conference at the Stormont Assembly building in Belfast after power-sharing restored. PACEMAKER BELFAST 11 AUGUST 1991. Gerry Adams at 20th anniversary of internment. PACEMAKER BELFAST 9/12/2005 Sinn Fein leaders Gerry Adams and Martin McGuinness pictured at Stormont with Denis Donaldson who was shot dead in County Donegal, months after being exposed as an agent who worked for the police and MI5 for 20 years. PACEMAKER BELFAST Bobby Sands (right) pictured in Long Kesh with Gerry Adams (front) and Brendan Hughes (left). PACEMAKER BELFAST 13/12/2000 US President Bill Clinton is introduect to Sinn Fein MLA members by Sinn Fein president Gerry Adams during his visit to Stormont this morning. PACEMAKER BELFAST 08/04/98: Ulster Unionist Party leader, David Trimble and Sinn Fein President, Gerry Adams pass within touching distance outside Castle Buildings, Stormont during a break in the negotiations before the signing of the Good Friday Agreement.